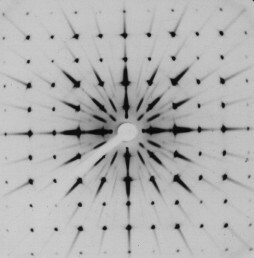 The techniques used to measure the intensities and angles of diffraction patterns have evolved over time. 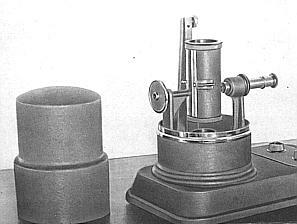 In the first diffraction experiment, Friedrich and Knipping (1912) used a film sensitive to X-rays, but even the same year, Bragg used a ionization chamber mounted on a rotating arm that, in general, could more accurately determine angles and intensities. 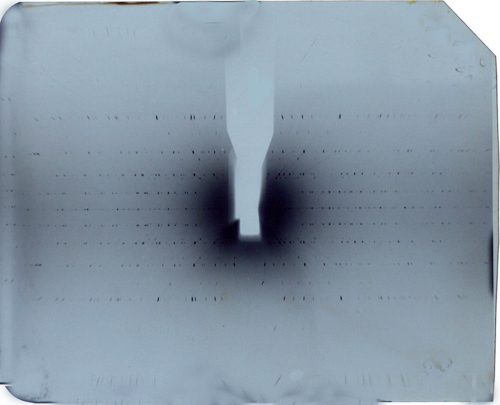 However, the film technique had the advantage of being able to collect many diffracted beams at the same time, and thus during the first years of structural Crystallography (from 1920 to 1970) an extensive use of photographic methods was made. Among them the following techniques should be highlighted: Laue, Weissenberg, precession and oscillation. Since the mid-1970's, photographic methods have been gradually replaced by goniometers coupled with point detectors which subsequently have been replaced by area detectors. Thus, the diffraction pattern will contain (for the same spacing d) the diffracted beams corresponding to the first order of diffraction (n=1) of a certain wavelength, the second order (n=2) of half the wavelength (λ/2), the third order (n=3) with wavelength λ/3, etc. 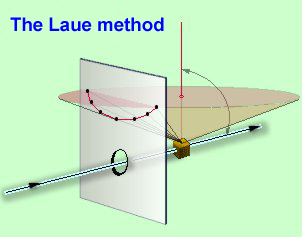 Therefore, the Laue diagram is simply a stereographic projection of the crystal. See also the simulation offered through this link. The Weissenberg method is based on a camera with the same name, developed in 1924 by the Austrian scientist Karl Weissenberg (1893-1976). 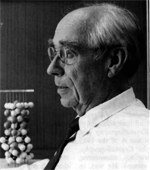 In order to understand Weissenberg’s contribution to X-ray crystallography one should read the two following articles that some years ago were offered the British Society of Rheology: "Weissenberg’s Influence on Crystallography" (by H. Lipson) (use this link in case of problems) and "Karl Weissenberg and the development of X-ray crystallography" (by M.J. Buerger). The camera consists of a metalic cylinder that contains a film sensitive to X-rays. 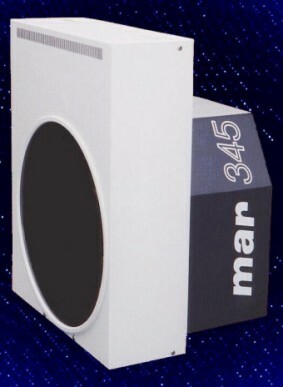 The crystal is mounted on a shaft (coaxial with the cylinder) that rotates. 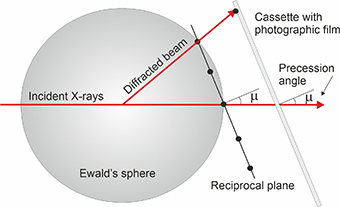 According to Ewald's model, the reciprocal points will intersect the surface of Ewald's sphere and diffracted beams will be produced. 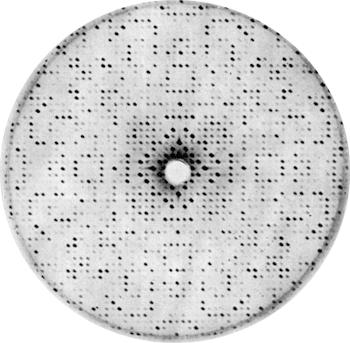 The diffracted beams generate black spots on the photographic film, which when removed from the metalic cylinder, appears as shown below. 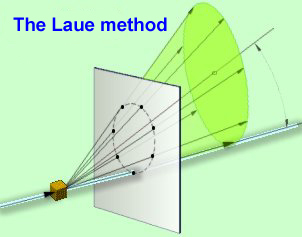 Scheme and example of a Weissenberg camera. This camera type was used in crystallographic laboratories until about 1975. Two types of diffraction diagrams can be easily obtained with the Weissenberg cameras, depending on the amount of crystal rotation: oscillation diagrams (rotation of approx. +/-20 degrees) or full rotation diagrams (360 degrees) respectively. Scheme explaining the production of a Weissenberg diagram of the rotation or oscillation variety. 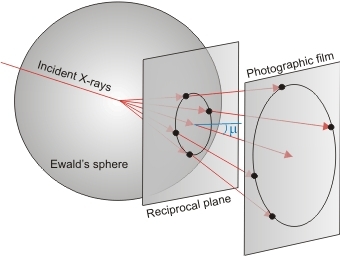 When the reciprocal points, belonging to the same reciprocal plane, touch the surface of Ewald's sphere, they produce diffracted beams arranged in cones. As shown in the diagram above, each horizontal line of points represents a reciprocal plane perpendicular to the axis of rotation as projected on the photographic plate. The figure on the left shows the real appearance of a Weissenberg diagram of this type, rotation-oscillation. As explained below, the distance between the horizontal spot lines provides information on the crystal repetition period in the vertical direction of the film. These diagrams were also used to align mounted crystals... 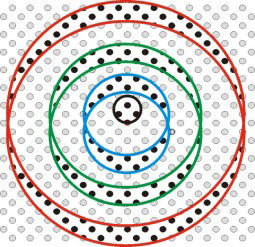 This technique requires that the crystal rotation axis is coincident with an axis of its direct lattice, so that the reciprocal planes are collected as lines of spots as is shown on the left. The crystal must be mounted in such a way that the rotation axis coincides with a direct axis of the unit cell. Thus, by definition of the reciprocal lattice, there will be reciprocal planes perpendicular to that axis. The reciprocal points (lying on these reciprocal planes) rotate when the crystal rotates and (after passing through the Ewald sphere) produce diffracted beams that arranged in cones, touch the cylindrical film and appear as aligned spots (photograph on the left). It seems obvious that these diagrams immediately provide information about the repetition period of the direct lattice in the direction perpendicular to the horizontal lines (reciprocal planes). However, those reciprocal planes (two dimensional arrays of reciprocal points) are represented as projections (one dimension) on the film and therefore a strong spot overlapping is to be expected. 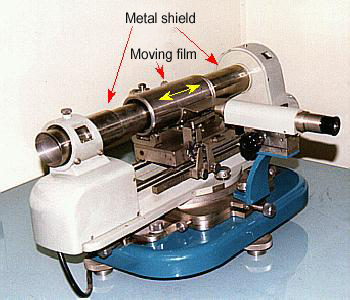 The problem with spot overlap was solved by Weissenberg by adding a translation mechanism to the camera, in such a way that the cylinder containing the film could be moved in a "back-and-forth" mode (in the direction parallel to the axis of rotation) coupled with the crystal rotation. At the same time, he introduced two internal cylinders (as is shown in the left figure, and also below). In this way, only one of the diffracted cones (those from a reciprocal layer) is "filtered" and therefore allowed to reach the photographic film. Thus, a single reciprocal plane (a 2-dimensional array of reciprocal points) is distributed on the film surface (two dimensions) and therefore the overlap effect is avoided. The appearance of such a diagram, which produces a geometrical deformation of the collected reciprocal plane, is shown below. Taking into account this deformation, one can easily identify every spot of the selected reciprocal plane and measure its intensity. To select the remaining reciprocal planes one just has to shift the internal cylinders and collect their corresponding diffracted beams (arranged in cones). Details of the Weissenberg camera used to collect a cone of diffracted beams. 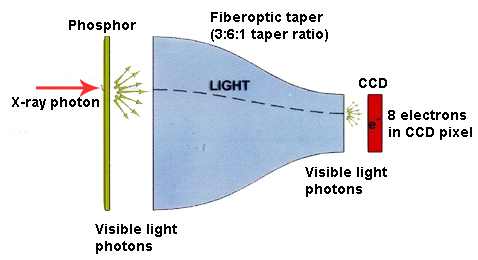 Two internal cylinders showing a slit, through which a cone of diffracted beams is allowed to reach the photographic film. 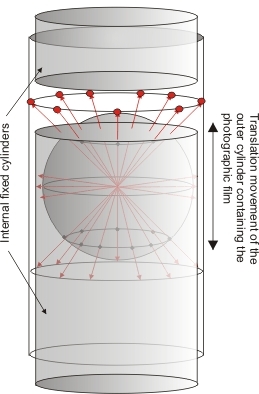 The outer cylinder, containing the film, moves back-and-forth while the crystal rotates, and so the spots that in the previous diagram type were in a line (see above) are now distributed on the film surface (see the figure on the right). Weissenberg diagram showing the reciprocal plane of indices hk2 of the copper metaborate. 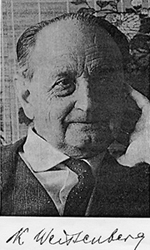 The precession method was developed by Martin J. Buerger (1903-1986) at the beginning of the 1940's as a very clever alternative to collect diffracted intensities without distorting the geometry of the reciprocal planes. As in the Weissenberg technique, precession methodology is also based on a moving crystal, but here the crystal moves (and so does the coupled reciprocal lattice) as the planets do, and hence its name. In this case the film is placed on a planar casette that moves following the crystal movements. In the precession method the crystal has to be oriented so that the reciprocal plane to be collected is perpendicular to the X-rays' direct beam, ie a direct axis coincides with the direction of the X-rays' incident. 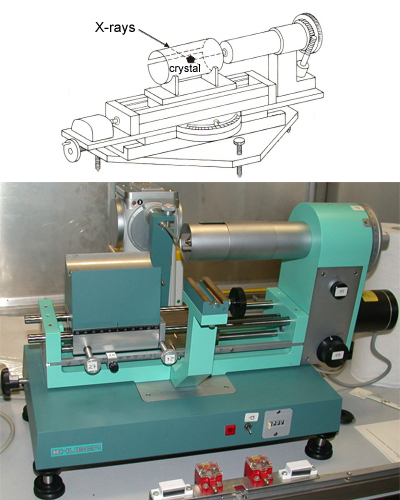 Two schematic views showing the principle on which the precession camera is based. μ is the precession angle around which the reciprocal plane and the photographic film move. During this movement the reciprocal plane and the film are always kept parallel. 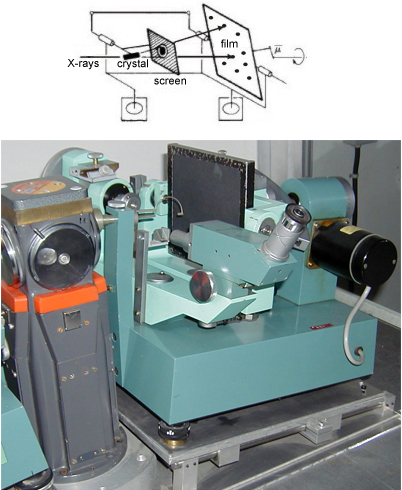 The camera designed for this purpose and the appearance of a precession diagram showing the diffraction pattern of an inorganic crystal are shown in the figures below. Precession diagrams are much simpler to interpret than those of Weissenberg, as they show the reciprocal planes without any distortion. 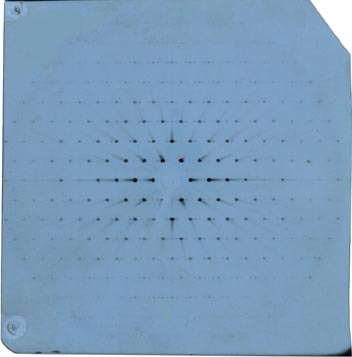 They show a single reciprocal plane on a photographic plate (picture above) when a circular slit is placed between the crystal and the photographic film. As in the case of Weissenberg diagrams, we can readily measure distances and diffraction intensities. However, with these diagrams it is much easier to observe the symmetry of the reciprocal space. The only disadvantage of the precession method is a consequence of the film, which is flat instead of cylindrical, and therefore the explored solid angle is smaller than in the Weissenberg case. Precession diagram of a lysozyme crystal. One can easily distinguish a four-fold symmetry axis perpendicular to the diagram. According to the relationships between direct and reciprocal lattices, if the axes of the unit cell are large (as in this case), the separation between reciprocal points is small. Precession diagram of a simple organic compound, showing mm symmetry (two mirror planes perpendicular to the diagram). Note that the distances between reciprocal points is much larger (smaller direct unit cell axes) than in the case of proteins (see the figure on the left). Originally, the methods of rotating crystal with a wide rotation angle were very successfully used. However, when it was applied to crystals with larger direct cells (ie small reciprocal cellls), the collecting time increased. Therefore, these methods were replaced by methods using small oscillation angles, allowing multiple parts of differents reciprocal planes to be collected at once. Collecting this type of diagrams at different starting positions of the crystal is sufficient to obtain enough data in a reasonable time. The geometry of collection is described in the figures shown below. Nowadays, with rotating anode generators, synchrotrons, and area detectors (image plate or CCD, see below), this is the method widely used, especially for proteins. Outline of the geometrical conditions for diffraction in the oscillation method. The crystal, and therefore its reciprocal lattice, oscillate in a small angle around an axis (perpendicular to the plane of the figure) which passes through the center. In the figure on the right, the reciprocal area that passes through diffraction conditions, within Ewald's sphere (with radius 2.sin 90/λ), is denoted in yellow. The maximum resolution which can be obtained in the experiment is given by 2.sen θmax/λ). 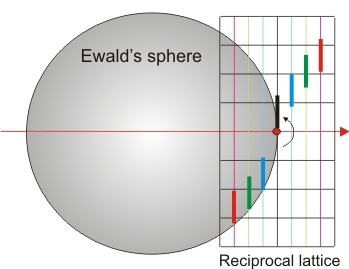 When the reciprocal lattice is oscillated in a small angle around the rotation axis, small areas of different reciprocal planes will cross the surface of Ewald's sphere, reaching diffraction condition. Thus, the detector screen will show diffraction spots from the different reciprocal planes forming small "lunes" on the diagram (figure on the right). A "lune" is a plane figure bounded by two circular arcs of unequal radii, i.e., a crescent. The introduction of digital computers in the late 1970s led to the design of the so-called automatic four-circle diffractometers. 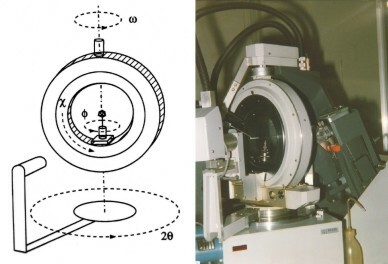 These goniometers, with very precise mechanics and by means of three rotation axes, allow crystal samples to be brought to any orientation in space, fulfilling Ewald's requirements to produce diffraction. Once the crystal is oriented, a fourth axis of rotation, which supports the electronic detector, is placed in the right position to collect the diffracted beam. All these movements can be programmed in an automatic mode, with minimal operator intervention. Two different goniometric geometries have been used very successfully for many years. In the Eulerian goniometer (see the figure below) the crystal is oriented through the three Euler angles (three circles): Φ represents the rotation axis around the goniometer head (where the crystal is mounted), χ allows the crystal to roll over the closed circle, and ω allows the full goniometer to rotate around a vertical axis. The fourth circle represents the rotation of the detector, 2θ, which is coaxial with ω. This geometry has the advantage of a high mechanical stability, but presents some restrictions for external devices (for instance, low or high temperature devices) to access the crystal. The detection system widely used during many years for both geometries (Euler and Kappa) was based on small-area counters or point detectors. With these detectors the intensity of the diffracted beams must be measured individually, one after the other, and therefore all angles had to be changed automatically according to previously calculated values. Typical measurement times for such detector systems are around 1 minute per reflection. 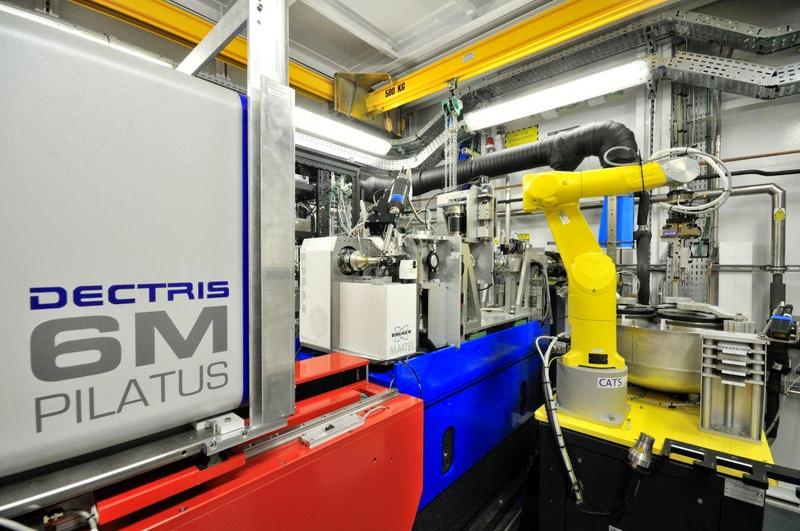 As an alternative to the point detectors, the development of electronic technology has led to the emergence of so-called area detectors which allow the detection of many diffraction beams simultaneously, thereby saving time in the experiment. This technology is particularly useful for proteins and generally for any material that can deteriorate over its exposure to X-rays, since the detection of every collected image (with several hundreds of reflections) is done in a minimum time, on the order of minutes (or seconds if the X-ray source is a synchrotron). 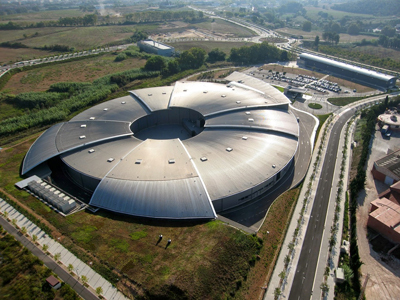 CCD-type detectors are usually mounted on Kappa goniometers and their use is widespread in the field of protein crystallography, with rotating anode generators or synchrotron sources. 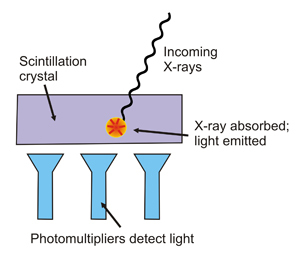 Another type of detector widely used today, especially in protein crystallography, are the Image Plate Scanners, which are usually mounted on a relatively rudimentary goniometer, whose only freedom is a rotation axis parallel to the crystal mounting axis. The sensor itself is a circular plate of material sensitive to X-rays. After exposure, a laser is used to scan the plate and read out the intensities. 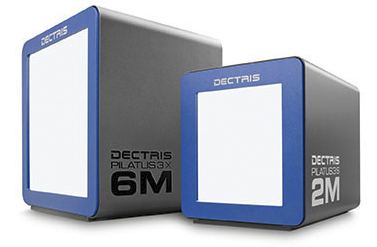 The latest technology involves the use of area detectors based on CMOS (complementary metal-oxide semiconductor) technology that has very short readout time, allowing for increased frame rates during the data collection. 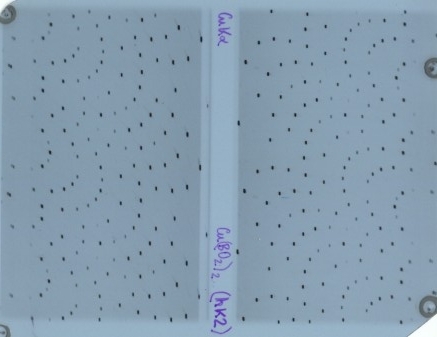 In summary, a complete data collection with this type of detectors consists of multiple images such as the ones shown below. 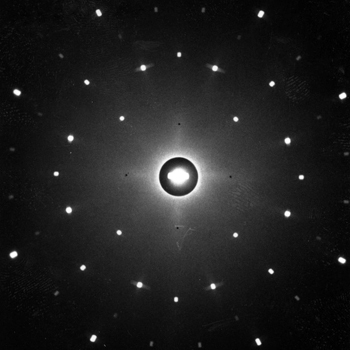 The collected images are subsequently analyzed in order to obtain the crystal unit cell data, symmetry (space group) and intensities of the diffraction pattern (reciprocal space). This process is explained in more detail in another section. 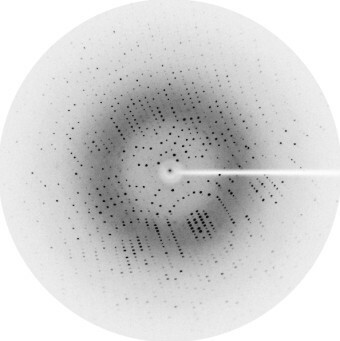 Diffraction image of a protein, obtained with the oscilaltion method in an Image Plate Scanner. During the exposure time (approx. 5 minutes with a rotating anode generator, or approx. 5 seconds at a synchrotron facility) the crystal rotates about 0.5 degrees around the mounting axis. The read-out of the image takes about 20 seconds (depending on the area of the image plate). This could also be the appearance of an image taken with a CCD detector. However, with a CCD the exposure time would be shorter. A set of consecutive diffraction images obtained with an Image Plate Scanner or a CCD detector. See also the example published by Aritra Pal and Georg Sheldrick. Scheme of a monochromator. A polychromatic radiation (white) comming from the left is "reflected", according to Bragg's Law, "filtering" the input radiation that is reflected again on a secondary crystal. 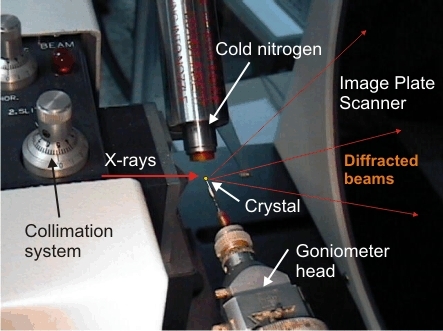 In order to get the largest and best collection of diffraction data, crystal samples are usually maintaned at a very low temperature (about 100 K, that is, about -170 C) using a dry nitrogen stream. At low temperatures, crystals (and especially those of macromolecules) are more stable and resist the effects of X-ray radiation much better. At the same time, the low temperature further reduces the atomic thermal vibration factors, facilitating their subsequent location within the crystal structure. 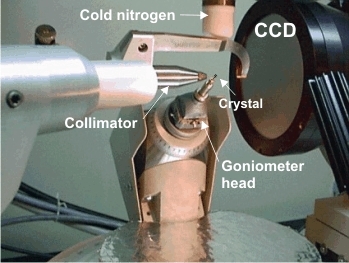 To mount the crystals on the goniometer head, in front of the cold nitrogen stream, crystallographers use special loops (like the one depicted in the left figure) which fix the crystal in a matrix transparent to X-rays. This is especially useful for protein crystals, where the matrix also acts as cryo-protectant (anti-freeze). The molecules of the cryo-protectant spread through the crystal channels replacing the water molecules with the cryo-protectant ones, thus avoiding crystal rupture due to frozen water. In any case, the crystal center must be coincident with the optical center of the goniometer, where the X-ray beam is also passing through. In this way, when the crystal rotates, it will always be centered on that point, and in any of its positions will be bathed by the X-ray beam. 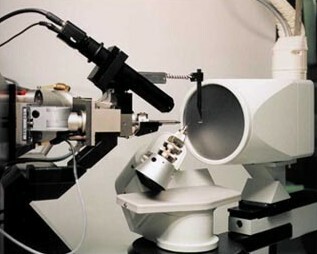 Cryo-protection system mounted on a goniometer. 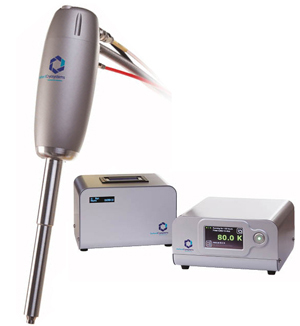 The nitrogen flow at -170 º C (coming through the upper tube) cools the crystal mounted on the goniometer head. The collimator of the X-ray beam points toward the crystal from the left of the image. Note the slight steam generated by the cold nitrogen when mixed with air humidity. In summary, all of these methodologies can be used to obtain a data collection, consisting of three Miller indices and an intensity for each diffracted beam, which is to say, the largest number of reciprocal points of the reciprocal lattice. This implies evaluating both the geometry and the intensities of the whole diffraction pattern.